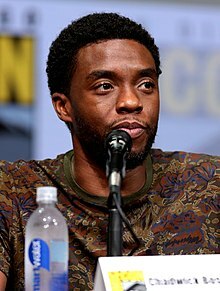 Chadwick Aaron Boseman (born November 29, 1977 or 1976) (sources differ) is an American actor known for his portrayals of real-life historical figures such as Jackie Robinson in 42 (2013), James Brown in Get on Up (2014) and Thurgood Marshall in Marshall (2017) and for his portrayal of the superhero Black Panther in the Marvel Cinematic Universe films Captain America: Civil War (2016), Black Panther, Avengers: Infinity War (both 2018) and Avengers: Endgame (2019). Boseman has also had roles in the television series Lincoln Heights (2008) and Persons Unknown (2010) and the films The Express (2008), Draft Day (2014) and Message from the King (2016). Boseman was born and raised in Anderson, South Carolina, to Carolyn and Leroy Boseman, both African American. According to Boseman, DNA testing has indicated that his ancestors were Krio people from Sierra Leone, Yoruba people from Nigeria and Limba people from Sierra Leone. His mother was a nurse and his father worked at a textile factory, keeping an upholstery business as well. Boseman graduated from T. L. Hanna High School in 1995. In his junior year, he wrote his first play, Crossroads, and staged it at the school after a classmate was shot and killed. He attended college at Howard University in Washington, D.C., graduating in 2000 with a Bachelor of Fine Arts in directing. One of his teachers was Phylicia Rashad, who became a mentor. She helped raise funds so that Boseman and some classmates could attend the Oxford Mid-Summer Program of the British American Drama Academy in London, to which they had been accepted. Boseman wanted to write and direct, and initially began studying acting to learn how to relate to actors. After he returned to the U.S., he graduated from New York City's Digital Film Academy. He lived in Brooklyn at the start of his career. Boseman worked as the drama instructor in the Schomburg Junior Scholars Program, housed at the Schomburg Center for Research in Black Culture in Harlem, New York. In 2008, he moved to Los Angeles to pursue an acting career. Boseman got his first television role in 2003, in an episode of Third Watch. His early work included episodes of the series Law & Order, CSI:NY, and ER. He also continued to write plays, with his script for Deep Azure performed at the Congo Square Theatre Company in Chicago; it was nominated for a 2006 Joseph Jefferson Award for New Work. In 2008, he played a recurring role on the television series Lincoln Heights and appeared in his first feature film, The Express. He landed a regular role in 2010 in another television series, Persons Unknown. Boseman had his first starring role in the 2013 film 42, in which he portrayed baseball pioneer and star Jackie Robinson. He had been directing an off-Broadway play in East Village when he auditioned for the role, and was considering giving up acting and pursuing directing full-time at the time. About 25 other actors had been seriously considered for the role, but director Brian Helgeland liked Boseman's bravery and cast him after he had auditioned twice. In 2013, Boseman also starred in the indie film The Kill Hole, which was released in theaters a few weeks before 42. In 2014, Boseman appeared opposite Kevin Costner in Draft Day, in which he played an NFL draft prospect. Later that year, he starred as James Brown in Get on Up. In 2016, he starred as Thoth, a deity from Egyptian mythology, in Gods of Egypt. He started portraying the Marvel Comics character T'Challa / Black Panther in 2016, with Captain America: Civil War being his first film in a five-picture deal with Marvel. He headlined Black Panther in 2018, which focused on his character and his home country of Wakanda in Africa. The film opened to great anticipation, becoming one of the highest-grossing films of the year in the United States. He reprised the role in Avengers: Infinity War, which was released in April 2018, and will return in Avengers: Endgame, which is scheduled to be released in April 2019. Boseman was raised a Christian. He was baptized, and was part of a church choir and youth group. His former pastor said that he still keeps his faith. Boseman has stated that he prayed to be the Black Panther before he was cast as the character in the Marvel Cinematic Universe. 2011 Justified Ralph Beeman Episode: "For Blood or Money"
2018 Saturday Night Live Himself Episode: "Chadwick Boseman/Cardi B"
^ a b c Holsey, Steve (August 6, 2014). "Star On The Rise: Chadwick Boseman". Michigan Chronicle. Detroit, Michigan. Archived from the original on August 4, 2015. Retrieved April 29, 2015. ^ a b "Chadwick Boseman Biography: Screenwriter, Actor, Director (1977–)". Biography.com. A&E Networks. Archived from the original on April 2, 2016. Retrieved May 9, 2016. ^ His age is given as 37, making his birth year c. 1976, at Rothman, Michael (October 29, 2014). "5 Things to Know About Chadwick Boseman". ABC News. Retrieved January 11, 2018. and Feinberg, Scott (October 29, 2014). "Ocsar Contender and New Marvel Superhero Chadwick Boseman on his Journey to Stardom". The Hollywood Reporter. Retrieved January 12, 2018. Neither source gives specific birth date. ^ Alexander, Bryan (January 31, 2018). "The best things you missed at the 'Black Panther' party (Usher dancing on the tables!)". USA Today. Archived from the original on March 6, 2018. Retrieved March 6, 2018. ^ Barrow, Jerry L. (February 2018). "Father Stretch My Hands: 'Black Panther' & Raising Our Sons To Shine". BET. Archived from the original on February 15, 2018. Retrieved March 6, 2018. ^ Colbert, Stephen (May 17, 2018). "Chadwick Boseman On Bringing Humanity To 'Black Panther'" (Interview). New York City: The Late Show with Stephen Colbert. ^ a b c d e Eells, Josh (February 18, 2018). "The 'Black Panther' Revolution". Rolling Stone. Archived from the original on February 25, 2018. ^ "Hanna Grad Chad Boseman Plays Jackie Robinson in '42'" (PDF). Parent Newsletter (47). T. L. Hanna High School. April 11, 2013. Archived (PDF) from the original on March 4, 2016. ^ a b Jenkins, Mark (April 11, 2013). "Jackie Robinson film '42' opens, starring Howard graduate Chadwick Boseman". The Washington Post. Archived from the original on May 9, 2016. Retrieved April 29, 2015. ^ McDonald, Soraya Nadia (October 29, 2014). "Everything you need to know about Chadwick Boseman — Marvel's new superhero, Black Panther". The Washington Post. Archived from the original on May 9, 2016. Retrieved April 29, 2015. ^ Jain, Sara McDermott (March 18, 2014). "DFA Grad Chadwick Boseman to Play James Brown in Biopic". Digital Film Academy. Archived from the original on December 22, 2017. Retrieved December 22, 2017. ^ Rose, Steve (November 20, 2014). "I got the feelin' – Chadwick Boseman on playing James Brown". The Guardian. UK. Archived from the original on June 12, 2017. Retrieved April 29, 2015. ^ Wood, Jennifer (October 28, 2013). "10 Actors Who Have Gone From Supporting Role to Leading Man in 2013: Chadwick Boseman". Complex. Archived from the original on October 13, 2016. Retrieved April 29, 2015. ^ a b c Gregory, Sean (February 21, 2013). "Going Places With Chadwick Boseman". Time. Archived from the original on March 2, 2016. Retrieved April 29, 2015. ^ Miller, Julie (April 12, 2013). "'42' Star Chadwick Boseman on Playing Jackie Robinson, Copying His Baseball Moves, and Being Stood Up by the President". Vanity Fair. Retrieved April 29, 2015. ^ Riley, Daniel (September 2014). "The Surprisingly Sudden Arrival of Chadwick Boseman". GQ. Archived from the original on February 18, 2018. Retrieved April 29, 2015. ^ Herndon, Jessica (April 8, 2013). "Chadwick Boseman: The Distinguished Rise of Cinema's Next Champion". Flaunt. Archived from the original on March 7, 2018. Retrieved April 29, 2015. ^ Yamato, Jenn (February 14, 2013). "Indie Vendetta Pic With Parallels To Christopher Dorner Saga Gets Release Date". Deadline Hollywood. Retrieved April 29, 2015. ^ Kaye, Don (April 11, 2014). "Chadwick Boseman on 'Draft Day,' Sports Legends, and Becoming James Brown". Moviefone. Retrieved April 29, 2015. ^ Fleming, Mike, Jr. (January 30, 2014). "Chadwick Boseman Set For Summit's 'Gods Of Egypt'". Deadline Hollywood. Archived from the original on September 25, 2017. Retrieved April 29, 2015. ^ Strom, Marc (October 8, 2015). "Marvel Studios Phase 3 Update". Marvel Entertainment. Archived from the original on January 16, 2018. Retrieved January 12, 2016. ^ Strom, Marc (October 28, 2014). "Chadwick Boseman to Star in Marvel's Black Panther". Marvel Entertainment. Archived from the original on October 28, 2014. Retrieved October 28, 2014. ^ Strom, Marc (February 10, 2015). "Marvel Studios Schedules New Release Dates for 4 Films". Marvel Entertainment. Archived from the original on February 10, 2015. Retrieved February 9, 2015. ^ "Marvel's 'Black Panther' Will Set Up 'Avengers: Infinity War,' Says Kevin Feige". The Hollywood Reporter. Retrieved February 13, 2018. ^ Remien, Shale. "Anderson native Chadwick Boseman stars as the Black Panther: Local pastor reacts". Greenville, South Carolina: WHNS. Archived from the original on February 2018. Retrieved February 16, 2018. ^ Watson, Elliot. "Chadwick Boseman on Black Panther and the healing power of cinema". Hunger. London, UK: Hunger Publishing Ltd. Archived from the original on February 16, 2018. Retrieved February 16, 2018. 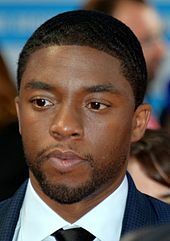 Wikimedia Commons has media related to Chadwick Boseman.